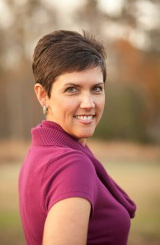 Julie Stubblefield, Founder of the Fit Mom Revolution, an online community focused on redefining how moms care for themselves joins eHealth Radio and the Weight Management and Fitness Channels. What are the biggest roadblocks people encounter when trying to make a change? What support systems or strategies need to be in place to ensure people succeed with weight loss? What inspired you to start doing this work? How do you support women in breaking the cycle of extreme dieting? If you would, please share one of your biggest success stories. After spending most of her adult life in the yo-yo diet cycle, Julie Stubblefield became determined to get fit for good. Seventy pounds lighter, she became a fat loss coach and opened her own personal training studio in Mechanicsville, VA.
Julie has spent the last few years working with hundreds of women to not only change how they eat and exercise, but also how they view themselves and their roles in this world. Knowing that the struggles moms face are universal, Julie launched the Fit Mom Revolution to reach women worldwide who are looking for support and guidance on their journey to live fulfilling and healthy lives. Julie's motto is, "Life is more than the size of your pants or the number on the scales. It's about the enjoyment of what's around you and the fulfillment you can experience while getting healthy." Note: Listeners pick up your free gift here.